Sakshi Prakash is a 10-year-old girl who goes missing from East Delhi. While the police are making zilch efforts to uncover the mystery behind her disappearance, a journalist follows the trails left behind by other such possible child kidnappings, and ends up unveiling an international conspiracy that’ll take the world by storm. 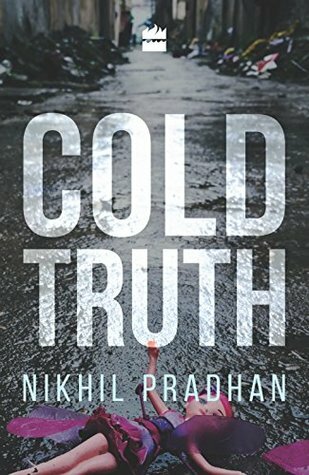 Written in an epistolary format, Cold Truth packs a punch with its emphasis on corruption and the possibilities of the unknown. While I’m always ready to devour a good mystery novel, it soon became apparent that Cold Truth was not what it looked like. It’s not a basic suspense fiction. The search for Sakshi spirals out and we come to realize how other cases, governments and agencies are involved in covering up certain life-altering mistakes. Amidst themes of conspiracy, experiments and the pursuit of truth, the plot execution has been managed splendidly. I would give brownie points to the author for thinking of such an intriguing plot. As for the writing style and language, I’d say this book is apt for intermediate readers. Conveyed through chats, newspaper articles, voice transcripts, official documents and other different elements, the story is pieced together by the journalist’s narration. There are portions where the writing makes use of some medical jargon, but apart from that, the style is quite straightforward. If you’re not used to reading many jaw-dropping books, you should prepare yourself for the insane amounts of gaping-mouth scenarios that are inevitable once you begin reading this novel of Nikhil Pradhan’s. It is simply mind-blowing! One issue I have with the book is that at times, I felt that the narrative would digress from the focal point of the scene/the chapter. The unnecessary bits could’ve been done away with. But on the whole, it is a spellbinding tome of 200 odd pages, which I finished in a sitting. This is one of those books (right up my alley!) that I’m not going to forget anytime soon. So highly recommend it! What do you get out of it? An unputdownable thriller that not only explores certain serious themes but also has a peculiar ending. Thank you HarperCollins India for sending me a copy of this book in exchange of an honest review.